Our new £6m specialist residential accommodation with learning and activities centre is taking shape at Pittville in Cheltenham. Our Student Union president Nathan Mattick officially left his mark on the project by hammering in the ‘first’ nail at a special ceremony on site. For Nathan, a third year learner at National Star, it was a special moment. The 19-year-old, who currently lives in at Overton House in Cheltenham, has been closely involved with the learner consultation about the new development at Pittville. The project will replace our existing but outdated accommodation at Overton House. There will be five buildings on the site in Pittville, containing a variety of specialist accommodation for 25 young people with disabilities. Gloucestershire-based building contractor Speller Metcalfe is currently on site building the five individual accommodation blocks, which will be mainly single-storey. One of the blocks will also be used as a learning and activity space. 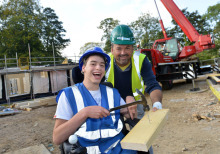 ‘Having worked alongside National Star on previous projects, we know first-hand what a fantastic addition this will be not only in terms of the provision of accommodation, but more importantly encouraging and helping young people with disabilities to live independently and become a part of their local community,’ said Andy Metcalfe, Joint Managing Director at Speller Metcalfe. Andy also explained how Speller Metcalfe and the project team is working hard to minimise impact locally: ‘On site we are working hard to protect and preserve the existing ecology as well as undertaking additional planting and landscaping to ensure the buildings blend in as much as possible with the local surroundings,’ said Mr Metcalfe. Pittville is due to be completed in March 2015. Interested in supporting the Pittville Project? Our Fundraising team would love to hear from you! Just give them a call on: 01242 524478.